The Slingjaw Wrasse or Epibulus insidiator is without a doubt one of the strangest fish in our oceans. This fish has an extendo mouth that protrudes out from its body to gobble up unsuspecting prey. This "slingjaw" can extend to half this fish's body! You can watch this for yourself in the videos below. Much like the deep sea Goblin Shark, this fish could easily be the inspiration for several modern day horror films. 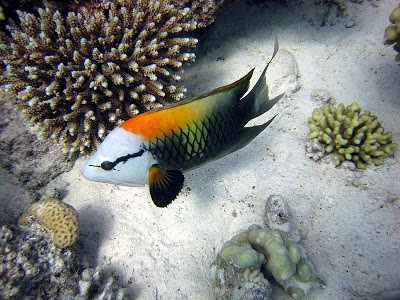 Lucky for us, this fish only grows to about 1' in length, so they are no danger to humans. This species of Wrasse is found in the Indian and Pacific Oceans in shallow, tropical waters. It will normally feed on small fish, crabs and shrimp, but watch out you never know when a Slingjaw Wrasse might be coming for your toe! This saltwater fish is also a protogynous hermaphrodite, that is it starts life as a female, but as it grows larger it becomes a male. The females will be a light brown or yellow coloration with the males featuring a dark stripe behind their eyes, with bits of white, yellow, brown and orange. If you have any additional information about the Slingjaw Wrasse please leave us a comment below.